NOSE: Pure spice. Cinnamon, nutmeg, cardamom, and cloves. Smells like a pumpkin pie with a touch of noseburn from the booze. TASTE: Pretty awful. I don’t mind a little spice in beer, particularly in pumpkin ales, but this was 100% spice with no malt and very little pumpkin character to hold it together. Tremendously unbalanced and poorly executed. Pumpkin ales are hard to pull off and this is certainly not one of Weyerbacher’s best efforts. We took a gamble with this brew at the package store and it did not pay off. Such is life. MOUTHFEEL: Lighter than medium. Actually, quite watery. The body didn’t hold up to the pungent spice at all. DRINKABILITY: Nil. It’s just a spice delivery vehicle with no other redeeming characteristics. I actually think my rating is too charitable, but I like Weyerbacher, so I’ll give them the Aleheads version of the gentleman’s F.
Posted in Tasting Notes.Tagged Alys Beach, Imperial Pumpkin, Pumpkin Ale, Slouch Sixpack, Weyerbacher. 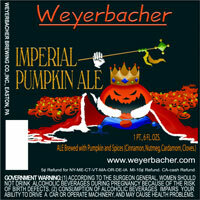 I liked the Weyerbacher Imperial Pumpkin a bit more than you, Slouch, but not by much. Tucked into a draft at Ginger Man in Norwalk, CT last weekend and was disappointed – as you suggest, a delivery vehicle for the spice cabinet.